I have no idea how I did it, but when I was a kid, I hardly ever slept. I couldn’t afford to. There was too much TV to watch. As time slowly crept to the wee hours of each morning and everyone else was asleep, I could be found in my living room huddled next to my television set. Some of my favorite things to watch on late-night TV were classic cartoon shorts. It didn’t matter who made them, how old they were, or if they were black and white or colored. I was captivated by them. That hasn’t changed. Yeah, I could’ve just waited a few hours and watched cartoons at a more “reasonable” time, but that’s not me. Watching cartoons alone in the dark really gave me a sense of companionship with the characters on my screen. I really felt like I was best friends with Mickey Mouse and the gang. We would go to the beach or try to catch ghosts. I was even invited to Mickey’s birthday party. 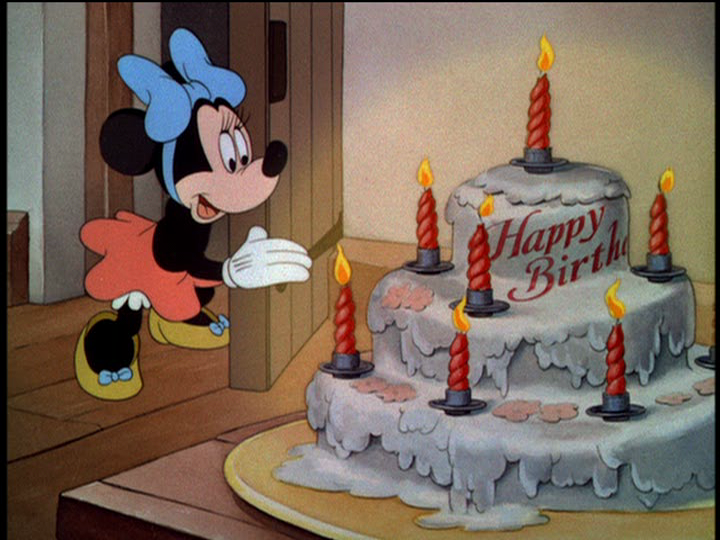 This is one of my absolute favorite Mickey Mouse cartoons, but not because of the birthday boy. Goofy and his cake escapades completely stole the show. That poor guy! I’ve had days just like his. You bake and bake, but nothing ever comes out right. When you’re finally happy with it or you just break down and buy a cake, you happen to trip and it collides with your friend. Thankfully, that didn’t happen with my cake. I’m not too great at decorating cakes, so it’s not the prettiest, but I felt like being a little ambitious in honor of my very own birthday. Grease and flour a 6-inch, an 8-inch, and a 10-inch cake pan. In a large mixing bowl, combine flour, baking powder, and salt. In a small bowl, combine milk and vanilla. In a standing mixer, cream butter and sugar until fluffy (about 3 minutes). Add eggs one at a time, beating well after each addition. Add flour mixture and milk alternatingly, beginning and ending with the flour mixture. Stir until just combined. Divide batter amongst pans. Gently tap or drop pans on the counter to remove air pockets. Bake for 30 minutes or until a skewer comes out clean when the cake is tested. Cool in pans for 10 minutes. Remove cakes from pans and wrap completely in plastic wrap. This will help keep your cakes moist. Cool completely on baking racks. Melt marshmallows in a large bowl in a microwave for 1 minute, stirring at the 30 second mark. Stir water and vanilla extract into marshmallows. Stir in powdered sugar a cup at a time until sticky dough is formed. Dust counter with remaining powdered sugar and turn out dough. You may want to rub your hands with shortening or butter to keep them from sticking to the dough. Knead dough until smooth, workable, and no longer sticky. This can take up to 10 minutes. Then it’s ready to use. You can also make this the night before. Just wrap it in plastic wrap, and chill. Allow it to warm up to room temperature before trying to work the dough. In a stand mixer, beat butter and shortening until fluffy. Add vanilla extract. Beat powdered sugar in, a little at a time. Scrape down sides of the bowl and add milk. If the icing is too thick, add more milk, ½ teaspoon at a time. Unwrap cooled cakes. Cut cakes to size and even out, if needed. Cover the cakes with enough icing to hold in the crumbs and allow the fondant to stick. Roll fondant out as thin as you can without tearing it. Cover bottom cake tier with fondant and smooth out sides so there are no creases. Remove excess fondant. Smooth out edges with hands or tools. Repeat with the other cakes and stack. Knead a small amount of pink food coloring into some remaining fondant. Shape small pieces of pink fondant into flowers or roll and cut out with a small flower cookie cutter. Scoop some icing into a piping bag with a large tip and pipe icing onto the sides of each tier and the top of the cake. Place fondant flowers on the cake. Add some red food coloring to a small bit of remaining icing and scoop red icing into piping bag with a thin tip. Pipe out “Happy Birthday” onto the side of the cake. Light some candles and get ready to sing! Variations: You can always use different sized cake pans if you want larger edges or a larger cake in general. The cake I made is very light in color, so if you want a more brown cake, add a little brown food coloring to the batter when you’re alternating the wet and dry ingredients. If you want to completely change it up, make whatever kind of cake you like best. You can also use pre-made fondant or icing if you’re pressed for time or just don’t feel like making any. Icing can also be made without the butter. Just double the shortening for even whiter icing. That’s the way my mom does it. 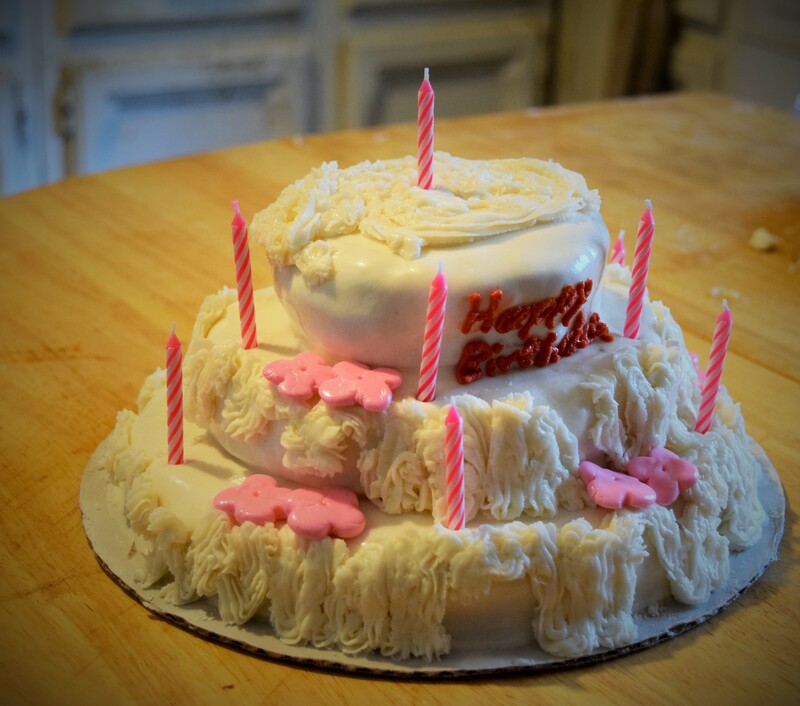 You can just use buttercream if you don’t care for fondant. After you initially ice the cakes, chill for at least 10 minutes. Dollop more icing on and spread until even and smooth. Chill the cakes again before you stack them and add the details. Since I was making this cake for just myself, I did single layer tiers, but typical tiered cakes have multiple layers. (And are much bigger and more work.) Just double everything, spread icing between cake layers, stack, cover the tier with icing, and move on to the next one. The cake’s not as big as Mickey’s, but it suits this birthday girl just fine. At least I’m not covered in it. Although I wouldn’t be too terribly upset. It’s still cake and it’s delicious even if it’s ugly or smashed. Hey, Mickey didn’t seem that heartbroken when he accidentally got his cake all to himself, now did he? Ohhh. I want to try making the cake! Thanks for the recipe.